The visuals of FINSTERWORLD are stunning. Richly detailed, at times glistening in the sun. Yet what is being depicted could initially seem inane. A wide cross section of characters, some closely related, and others coming upon one another through happenstance, go about their days, recalling the tangled web of relations in Magnolia. Many relations are shown: that of an aging couple rekindling passion, a far younger couple for whom individual ambitions and needs create a growing rift, a high school’s pair of alpha males and an outsider pair between which romantic interests create malicious intentions, and the liberal minded teacher in charge of their behavior. Through slow and deliberate storytelling, a hypotheses are formed about the way these social groups navigate their relations. What they have in common is a shared national identity, one that is made out to be overshadowed by the reach of a dark history. This manifests as feelings of shame, either of the self or the surrounding culture. Sometimes. Other characters, the young in particular, are often at odds with those of the adults. Conflicts between teacher and student, parent and young adult offspring arise. The film also deals with those forming fascinations with aspects of life that the mainstream majority would be uncomfortable with – ‘fetishes’ being the shorthand. A man who provides pedicures and therapeutic treatment for people’s feet has an all-encompassing attraction to them, including those of an elderly woman he treats. A traffic officer is a “furry,” someone with an interest in wearing head to toe body suits resembling animals that maintain human characteristics. These interests are not ridiculed. Rather, they are shown with sensitivity and related back to more general difficulty being at ease with oneself. Director Frauke Finsterwalder masterfully brings about a change of tone from neutral to dark, as when the sky darkens and clouds gather ominously to signal a brooding storm. The cruelty of high school students put at odds with each other due to social class hierarchical differences and budding hormones comes to the fore. The police officer’s need to express his desire to his wife, a frustrated documentary filmmaker, threatens to lead to a severe disconnect between the two. Characters’ lives are threaded together in absorbing ways leading to results that defy conventional notions of karma. Perhaps much like life as we know it, fates are not always deserving. Yet, there is also the potential for those seemingly hopeless to connect with the world around them to experience gratifying instances of community. 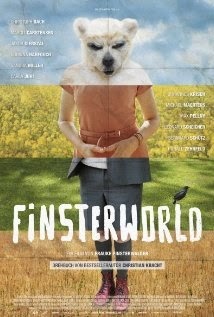 FINSTERWORLD plays as part of the 2014 Kino Festival of German Films in New York on Monday, June 16, Sunday, June 15 and Tuesday, June 17 at 4 pm and 9:30 pm. On Tuesday, there will also be a free talk held with director Frauke Finsterwalder and screenwriter Christian Kracht, From Script to Screen, held at the Deutsch Hause at NYU. Visit the website for more details or to buy tickets.